Are you interested in learning about natural remedies for common ailments such as colds, the flu, and migraines? Do you want to know how you can boost your immune system to stay healthy during flu season? Have you ever struggled with treating acne, eczema, or any other type of skin condition? Are you looking for ways to treat stress, anxiety, and depression without prescription drugs? If you answered "Yes" to any of those questions, you’ve found the right audiobook. Medicinal Herbs: A Beginner’s Guide covers eight healing herbs. You’ll learn their benefits, how to use them, and how you can even grow them on your own. 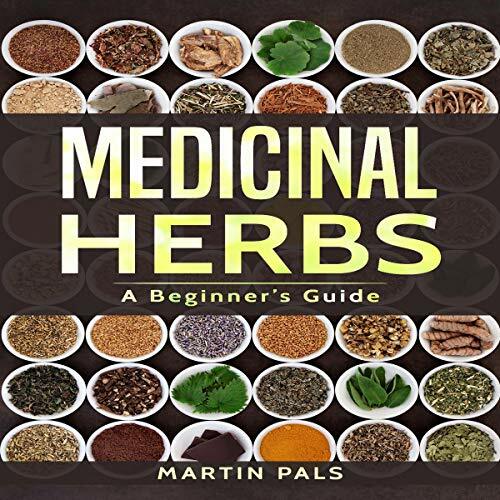 We’re just going over the basics, which makes this audiobook perfect for anyone interested in herbal medicine but who has never tried it before. As the wellness trend continues to grow, more and more people are interested in learning about natural alternatives to prescription drugs and over-the-counter medicines. Medicinal herbs are a great place to start. As you’ll learn in this audiobook, incorporating these herbs into your daily life isn’t so hard. Tea, aromatherapy, pill supplements, and topical ointments and salves make herbs easy to use on a regular basis. We’re also sharing how you can make your own herbal teas and essential oils infused with your homegrown herbs. “Wellness” may be a trend that has only grown in popularity over the last few years, but the natural remedies being practiced are nothing new. Herbalists, naturopaths, and people in cultures all over the world have been practicing herbal medicine for centuries. There’s a reason why herbal medicine is still practiced today. Herbs work, are effective, and can treat a wide array of health conditions as well as prevent you from catching colds or developing cancer. Your path to a healthier, more natural life starts now. Listen to this audiobook to see just a glimpse of what medicinal herbs can do for your life. Incorporating herbs into your daily routine is a small, relatively easy change. The results, however, can be significant and drastically improve your health, happiness, and life in general.